At the New Warriors' headquarters, the Crash Pad, Spider-Man meets with reporter Ben Urich to discuss the recent odd behavior of Nova. After exchanging their greetings, they enter the Crash Pad to confront Nova. Meanwhile, in lower Manhattan, the villain known as the Corruptor is busy admiring his handiwork. 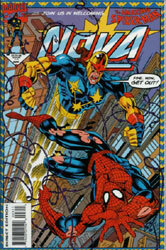 On the front page of the Daily Bugle, the headline reads "Super Hero Disgrace" along with a photo of a wild-eyed Nova! The story begins a few days before at the Lindsey Children's Hospital construction site. Peter Parker and Ben Urich are investigating the Braggatello Construction Firm and their alleged mob connections. After receiving less than cooperative treatment from the workers, Urich goes back and writes his expose on the firm. Later that morning, the Daily Bugle receives a visit from Nova. Nova angrily threatens the Bugle's publisher, J. Jonah Jameson, and warns him to stop their investigation. Back in the present day, Spider-Man and Nova talk about the recent events. Nova admits he was responsible for what happened but his actions were being controlled by someone else. Nova is troubled most by the fact that he doesn't know who did it or how it was done. The Human Rocket recounts how he had applied for a job at the construction site recently but was turned away. After being rejected, Rich went to a nearby diner to continue looking through the want ads. Suddenly, he was approached by a well-dressed, well-spoken man. The stranger seemed familiar to Rich but all he could focus on was the man's voice. Rich listened as he was told everything he wanted to hear about life. The man told Rich he could get him the construction job except for one problem. The Daily Bugle was attempting to close down the site. The well-dressed stranger suggested that if someone with power could get the Bugle to stop bothering them, then Rich could have the job. Afterwards, Nova said he couldn't get the man's voice out of his head and decided to take action against the Daily Bugle. Spider-Man believes Nova and decides to help discover the true villain. The next night, Spider-Man comes back to the construction site to find Nova behaving irrationally again. Nova is juggling steel beams and the two begin to battle. Nova knocks out Spider-Man with a Gravimetric Pulse and flees after realizing what he has done. Spider-Man is uninjured and was able to take the photos of Nova which appeared on the Daily Bugle. Back in the present day, Ben Urich informs Nova of some research he has conducted. The company who gained the new construction contract since the Braggetellos were removed was owned by Jackson Day. Nova immediately knows who has been controlling him. Jackson Day is the true identity of the Corruptor! Nova races to the Day's office and forces a confession by hanging him out of a window. The Corruptor explains that he did nothing but release the anger Nova has been always had inside. He also explains that Nova was nothing more than a pawn in his plan. The Corruptor wanted his company to gain the construction contract and Nova was simply a tool to get it. Later, as Nova returns to the Crash Pad, he is being watched by a shadowy figure with a Nova-like helmet. The silent figure watches Nova for awhile and then leaves. Meanwhile, on an island of mutated animals, a condor is offered the opportunity to become human again.